There's a heat wave in London, and by human making. I prepare to head out on the prowl to see what's on offer for decorative sustainable design resources in the city. Something that has been heavy on my mind: What is the relevance of creating or buying any object, in the year of 2018, that doesn't consider sustainability? As the earth and climate continue to show alarming signs of distress, there is no better time than now to make the extra effort for the best possible, locally-available, sustainably-designed furnishings and materials for your lifestyle. Considering the global plastic crisis due to China refusing to accept the world's plastic, the lack of waste and recyclables management, the failure of Fortune 500 corporations to take responsibility for the plastic that they have created and peddled, and the critical mass of people continuing to buy packaged goods, what will the world decide to do now with 91% of global plastic piling up on land and being dumped by the tons into rivers and oceans? Thankfully, good design shepherds and shop curators are raising awareness on the plastic crisis, and some are making small waves by doing what by-and-large isn't being done anywhere else—actually, recycling it. Using an apartment near St. Paul's Cathedral as my base, I finish my porridge and jam and take the Tube to Portobello Road in Notting Hill. Among the floral-facaded homes and antique shops you will find Katrina Phillips, a beautiful selection of Vietnamese bowls, healing crystals, baskets and art. In this selection is a dining table that appears to be made out of earthly natural stone, but it's actually made from reclaimed plastic synthetics, refrigerator interiors and lawn furniture. The Melting Pot dining table, by Dutch designer Dirk Vander Kooij, is made through his house-developed extrusion process that's molten disposable plastic pieced together by a robotic arm. Color options also include a painterly monochrome and vibrant multicolor palette. No two pieces are the same. Heading over off the South Kensington stop, near the Victoria and Albert Museum, I pass by an impeccably dressed man walking in the opposite direction, his arms linked with a young lady, as he says "...or we could move to the U.S.," and laughs out loud. The sun is full on as I move slowly down pristine blocks of period row houses and take in the renovating sounds of a chop saw. I observe a painter carefully protecting a window box of pink flowers with translucent plastic sheeting. Rounding a gated park, there nests a very well-edited shop called Mint. Mint is a great source for sustainable design interiors in London. One of the most impressive pieces is the Debris Lounge Chair, by Carmen V Machado, which is composed of an oak base and hand-woven textile made with reclaimed ghost netting and plastic monofilament. The artist has collected pieces of rope and fishing line from beaches in the UK and Puerto Rico. 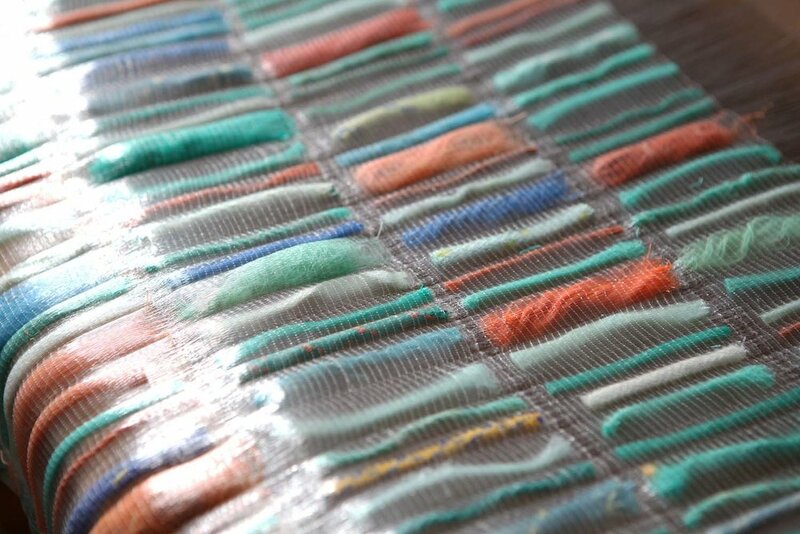 She isolates them by color within the textile in order to spread awareness about over-fishing and what we are doing to our oceans. Other standout originals are intricately woven and crocheted textiles created with recycled plastic by traditional crafts artists in Mexico. The few magnificent pieces that Mint has left of the artist work can be used as table runners or hanging art. They could be styled gracefully on a piece of furniture. Hopping off the Underground's Angel Station stop in Islington is lifestyle shop In-Residence. There hangs a mystic wallpaper called "Enchanted Garden" by Anna Surie for NLXL. The illustrative subject matter reminds me a bit of outsider artist Henry Darger. The shop owner leads me to her recent work. 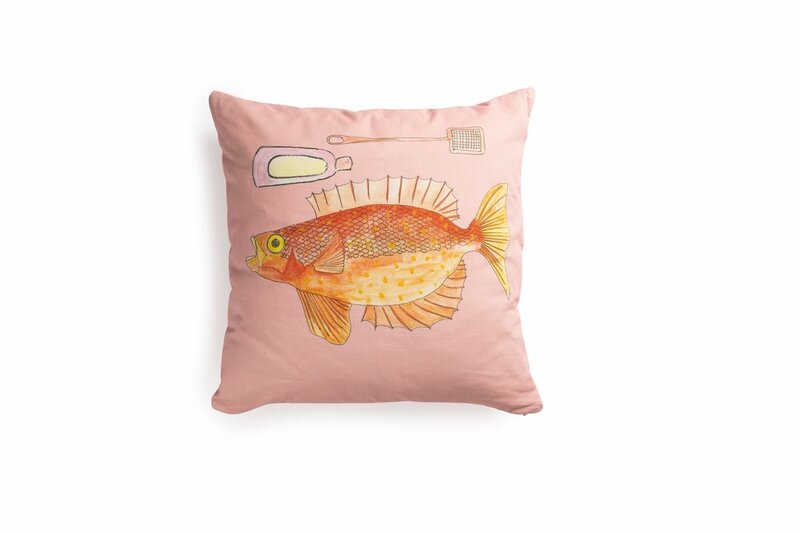 Anna Surie's own brand has a new line of cushions, wallpaper and curtains that brings light to the darkness of the plastic epidemic and its impact on our environment. 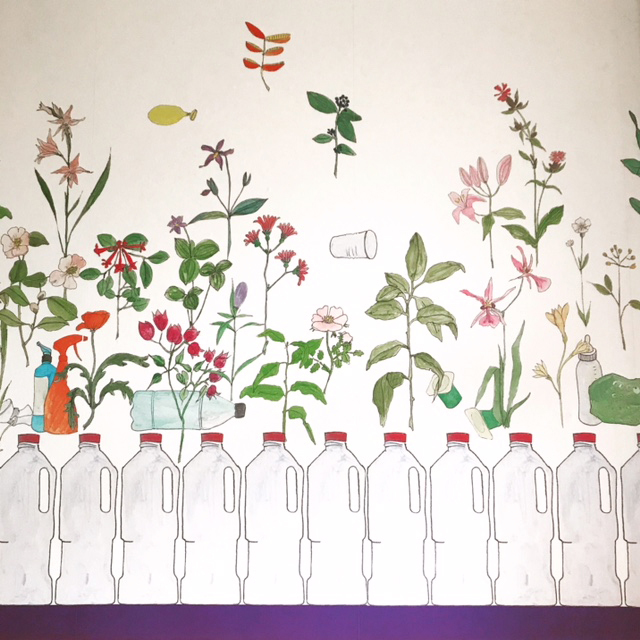 Her illustrations printed on wallpaper and organic bio-cotton manage to raise serious questions about our relationship with plastic despite a beguiling, whimsical style and feel. The Anna Surie wallpaper depicting flower sprigs mixed with waste is called "The Eye of the Beholder." When carefully considering design options for the kitchen, more and more homeowners are stepping away from the idea of gas flames and turning on their induction cooktops. The energy efficiency and easy-to-clean capabilities are certainly the strength of the appeal, yet there are even more reasons to go the induction route. Check out a quote on my perspective for Karen Elder's piece for SCHOTT glass on why designers love induction cooktops for their clients— link here. For that bright and airy feel, SCHOTT Ceran also makes white, glass, ceramic induction cooktops that incorporate well into lighter countertop looks. Nothing can take humans away from the primal appeal of cooking over an open flame completely. To get your fix, there are always outdoor fire pits. With global warming and greenhouse gases climbing to levels never before experienced by humankind, the good news is there’s still hope yet. Recently, I heard Paul Hawken speak at ABC Carpet & Home about the collective nonprofit coalition that created the book Drawdown: The Most Comprehensive Plan Ever Proposed To Reverse Global Warming. The book has some surprising—and encouraging—insights on what those solutions are. How often do the spinach and arugula go bad in your fridge? You had great intentions at the grocery store, but didn’t get around to making all those salads. You’re not alone when it comes to wasting food. If food were a country, it would be the world’s third biggest emitter of greenhouse gases after China and the U.S., according to Drawdown. One solution is to buy fresh perishables in smaller quantities for planned meals. Additionally, food is often perfectly fine to eat after expiration dates and best-used-by dates, and some wilting produce can still be used in the juicer. Cilantro saying, "Hurry up!" in my fridge. If you can't shop for less more often, a great product to prolong your food's life is FreshPaper. Add these sheets made with organic spices to your fruits and veggies in the fruit bowl, existing packaging or fridge drawer and save them 2-4x longer. Turn shower on; wet yourself. Turn shower off; soap yourself. Turn shower back on; rinse yourself. Create a fun challenge for yourself and your family by limiting showers to five minutes. This can reduce water use by 7-8 percent a year. And if you want the best showerhead developed with aerospace engineering—it’s almost here. The Nebia showerhead atomizes droplets, producing more droplets dispersed over five times the area of a regular showerhead. It is thirteen times more thermally efficient, so you feel the heat on that body more. It reduces water use by 70 percent compared with conventional showerheads—even 60 percent more than the WaterSense showerheads available. Here’s the list of comps on the EPA-approved WaterSense toilets. Keep in mind that 0.8 GPF (gallons per flush) is the lowest water use of any toilet on the market. According to Best Toilet Guide 1.28 GPF is a sweet spot for performance and water saving combined. A smart one I’ve found that uses the least amount of water in any single flush is Niagara Stealth, which at 0.8 GPF uses patented Stealth technology that makes for a quiet flush—meaning that you get the added bonus that no one can visualize your bathroom business. Let’s call this clean living for your clothes, your thoughts AND your environment. Choosing a water-efficient washing machine in your home can save up to 17 percent in water usage, and by washing only full loads of clothing it can save up to 7-8 percent of your water use over a year. Washing with cold water helps save energy even further. When comparing the ENERGY STAR most efficient large capacity front-loading machines, the Kenmore #4116 has one of the lowest annual energy and water use for its size category. You can get more comparisons for your ”dirties” here on the ENERGY STAR site. There’s no excuse anymore, since LEDs have made big advances in achieving warmer incandescent-like color temperatures. LEDs use 90 percent less energy, and that means saving money as well. There are great energy-efficient bulbs available including options by Cree. A big favorite is the Cree 9.5 Watt Warm White bulb that you can dim as needed. You can start phasing in LED lighting in a room you spend the most time in. Layer lighting, so you use light only where you are when you really need it. Some smart home technology can sense this as well, but if you can't go all high-tech, you can simply create smart LED mood and task lighting where you can. No one needs to see everything and everyone overly lit all the time. We're overexposed most hours of the day as it is. There’s a lot more advice where those five came from. The Drawdown book lays out 100 substantive solutions gathered by leading peer-reviewed scientists and policymakers around the world: solutions that have the ability to reverse atmospheric carbon buildup in 30 years. There are hands-on practices that are available now. There are technologies that exist now. Project Drawdown encourages us all to make use of these solutions and to seek others for our "reimagination of the world." We have the opportunity to draw down the level of greenhouse gases in the atmosphere by starting in our own homes. The motivation is simple: becoming a part of the solution to save humanity and our one, true home. Jökulsárlón, "glacier river lagoon" and "glacier lake" in Iceland. The lake is increasingly growing and doubled in size in a 15-year period due to the melting Vatnajökull glacier. We can also help save it from completely disappearing. When the first booking came in for Willow, the raw event space I worked on in downtown St. Louis, it was for none other than former St. Louis Cardinals hero, David Freese—and his gorgeous wife Mairin. Now, if you were lucky enough to be following Major League Baseball postseason in 2011, it was arguably one of the best series of all time. Apparently, David Freese has always been a big fan of the food at Bailey's Restaurants. We were honored that they chose Willow for their wedding celebration with friends and family. Willow was designed with whimsical branch chandeliers, wood and white metal seating and a warm Benjamin Moore Glacier White color that becomes a fresh canvas for any personalized event design. Freese now plays for the Pittsburg Pirates but he will forever be a St. Louis legend. We wish him and his wife the very best— they're always welcome home! Photography by the talented Katie Roberds of Vein + Vessel. “What I love most about owning a small business is that each project is as distinct as the individual/s that I work with, be it for a single client, a family or partners in a business,” Brynne Rinderknecht, the designer and force behind From the Inside shares. “I enjoy being a conduit in revealing their story and ideas and connecting that life to their surroundings of their home or business." We’re all guilty of it. Buying crap for our home we don’t need and then, after it’s too late to return, regretting it. Sometimes the purchase feels like it stems from an altered state or some deeply seeded coping mechanism that’s beyond our control. The lies we tell ourselves. There’s a lot of focus on decluttering our homes, but how do you prevent these unnecessary and unhealthy things from getting into your home in the first place? As an interior designer, I find myself talking clients out of buying things as much as I advise them on what they should buy and invest in. I’m not an enabler ;). At times I’ve had to scold clients for buying things that were superfluous, environmentally toxic or just plain wrong for them and their home. Don't even get me started on the taxidermy elephant from Africa that supposedly "died of natural causes." Or the thing that looks just like the original at a ridiculously unbelievable price. If they don’t know it at the time, they'll eventually realize their bad decision. Recently, I watched The Century of the Self, a British television documentary that came up at an event called "Mindfulness for Creatives" that I attended last month. The TV doc told the story of Edward Bernays. He was Sigmund Freud’s nephew, and he used Freud’s theories to teach corporations and advertising companies (even politicians) how to manipulate consumer behavior. His theory was that consumers are essentially brainless, merely slaves to the subconscious persuasion of their selfish desires. The idea is that our primitive desires can be manipulated and that we are not at all in control of what we buy. Here are three questions to ask yourself before buying that shiny, new thing you just have to bring home—and that will help you snap out of those mindless impulses! Without the expletive, you’re not seriously asking yourself the question. #2: “Does it feed my inner spirit?" If it does feed your spirit, let it be a valid thing that aligns with your values and enriches your life in an artful or intellectual way. #3: "In the future, will others admire my reasons for buying this item into my world?" Basically, is this object something that someone, somewhere down the line, will appreciate you supporting and perpetuating? When you buy, consider things for you and your home that are antique, vintage or innovative—well-designed or quality-crafted things made with materials that support your society, human beings and the environment. We are all curators who collect things of our times into our homes, and we will eventually be judged by future generations. What will they think when they start digging into our archeological site? Could our habits become a posthumous embarrassment? Do you care? We will buy the things that appeal most to our base emotional impulses. In a nutshell, that's what Edward Bernays believed. But what if you could prove Edward Bernays wrong? Get ready for some mysterious creative energy tonight during the black moon! The black moon, which is given its name when the second new moon occurs in a single calendar month. However, like most occurrences within space that we attempt to define, there is some debate and additional meanings for the term "black moon." A new moon occurs typically every 29.5 days and then disappears from the sky as it passes between the earth and sun. The illuminated side is faced away from us during the new moon. As the sky becomes dark tonight, there is more focus for reflection—from the inside—to allow your creativity to flow. Whatever your outlet may be, it's time to brainstorm your next project or start experimenting and making your individual magic. Here are some of my go-to paint and pigment colors that create a backdrop or accent for inner reflection. The next black moon that disappears from our view twice in one month will occur on July 31st, 2019. Universal Black by Benjamin Moore, Pitch Black by Farrow & Ball, Fade to Black by Portola Paints, Black Magic by Sherwin Williams, Black Iron Oxide by Earth Pigments, Off Broadway by Behr. "Convey who you are or what your business or brand is about, and reflect that concept—that life—in your living or work space." Here are some of my thoughts that I shared recently with TheProducer.com for a piece on appreciation and working in the styling and interior design world. When I moved to New York, I wanted a chance to spot Bill Cunningham. Then one morning, walking down Fifth Ave a few years ago, that chance came. He was in his usual blue worker's coat, smiling, off his bicycle and making his natural observations with his camera on the sidewalk. He appeared effortlessly unaffected by narcissism. He's the kind of person who had a documentary made about him but apparently never bothered to see it before his recent death. What he did see was nuance in pattern, rhythm, detail, color, cut, line, historic reference and distinction in fashion and in the people who became the subjects of his photographs. Of course, I was mortified by the unremarkable outfit I was wearing when I saw him. What a missed opportunity. I knew I could have dressed better for him. Not that it mattered. I could see him; he didn't really even see me. I was sure to keep my distance in slow motion and just enjoy watching him. I will miss knowing that he's no longer out there, using his keen eye to observe our world, our streets and ourselves. He was truly independent. Asparagus aethiopicus or densiflorus?, street name: "Foxtail Fern"
House Plants in the City: "I Don't Give a Fiddle Leaf Fig"
It’s probably easier to score drugs in New York than it is to get your hands on a good rare house plant. When I say “rare,” I mean anything other than a fiddle leaf fig tree, whose over-exposure in photography and interiors has been well noted for some time. I’ve been guilty myself of pushing the fiddle leaf fig in the past, for production shoots and interior projects. I get it—they have a beautiful, organic shape, a leathery leaf texture, and they remain addictive to buyers in the house plant market. But what if there was a different kind of plant out there for you to consider? In recent months, I’ve been actively changing things up in the interior botany department for my clients, and I often find myself at the 28th Street flower market between 6th and 7th Ave. I search in and out of the shops and I wait for a unique tree or plant to roll off the trucks. I go early in the wee hours and I go later before most of the plant places close up at 3pm. I go multiple times during the week sometimes and even ask the dealers to show me what else they have in the off-site grow houses. But it takes time and patience to find a meandering, distinct specimen that speaks to me and my clients for just the right spot. It is certainly clear that supply is still meeting demand for the fiddle leaf fig, aka Ficus lyrata, originally from West Africa. If you have one already, there is no shame—continue to love and care for it. However, there are other species out there that can help you with your next interior oxygen fix. *Arbequina Olive is a nice variety as well. The olive tree is one of the earliest known cultivated trees and rich in symbolism. *This is one of my favorites due to its shape and rusted look of the edges. It seems to have its own history. *Every space can likely handle a touch of red. *The vibrant green bushy tree is back! *They have white blossoms, which then turns into edible fruit and brings good fortune. *The right kind of shady lady. Few people seem to exist along this mystic coastline. Is it the dangerously skinny highway on the steep edge of the unknown that prevents people from coming in droves? Or the fear of spotty cell service; the silence that would make people confront their own thoughts? It was becoming dusk, as a last min tent purchase was being built on a cliff clearing that blurred into the overcast Pacific Ocean, only to realize during the pitch that it was a very small pup tent. In order to be outstretched, my head would need to be poked outside the zipper door, under the stars, to sleep. Thankfully, there didn’t seem to be many critters. The next day, Ramblin’ Jack Elliot was playing at the Henry Miller Memorial Library on his 75th birthday. This was a reason as any to take a trip to the California coast. When Jack was 15 years old, in Brooklyn, he ran away from home to join a traveling rodeo: The mere beginning to his ramblin’. Johnny Cash once said, “He’s got a song and a friend for every mile behind him.” I wanted to see him play banjo. And there he was outside on the intimate library grounds storytelling. One spare tree peered over us listeners among all the greens. Was that Henry? He and Jack both have had a special June. Amber light darkened into blue. As the show broke up, I was approached by a traveling poet who offered me the choice of a joke or poetry, in exchange for a donation. Not a fan of on-the-spot jokes, I opted for poetry. He finished a meandering slam with good spirit. I reached in my bag and found a twenty-dollar bill that was his for his hustle. The poet invited my companion and me back with him to hang out and share a meal. We followed him with a few others, trustingly, into a tucked away camp, where we fired up a pit to cook quesadillas. The starry night surveyed us. A musician, Dan Kahn, played one of his songs, Coney Island, on the ukulele, as half-lit faces tuned in closely under towering sequoias. The unexpected late night conversation between converging strangers still lingers, sparking at moments and then disappearing, like rising embers into the dark. Under the forested canopy of Big Sur and on the hidden pockets of isolated beach, is a place where one can easily feel to be on the brink of discovering new life or surrendering to the crudity of the earth. For me, it’s the sense of solitude that is possible and the pulse of the ocean that feels like a god breathing to me something essential that I need to know, now. Another takeaway from Highway 1 : Remember to give back to the traveling poet. It was such a pleasure to be part of the Open House blog for NBC New York.com. Check out the video piece and see how to stretch one room into two spaces for flexible NYC living. Recently, I was shopping for a rug for a client's daughter and came across this fun, watercolor, sheepskin rug by AELFIE out of Greenpoint, Brooklyn. It reminded me of a trip that I made last year with my husband on the Dingle Peninsula in County Kerry Ireland, where these particular painted sheep kept us company while hiking Mt. Brandon. The dyeing or pearl dip of the sheep is for tracking and is also used as a way to tell when a ram mounts an ewe. Clearly, Ireland sheep live the good life. Warm Strokes on the Upper East Side. From many stories above, overlooking the East River, one can see and feel myriad movement. For my client, we wanted to create a place to sit and enjoy it. To add color and warmth to the apartment, the rug was a crucial element. It's the piece that grounds the space and can influence the rest: artwork and soft accessories, such as Kevin O'Brien pillows; French vintage armchairs upholstered in a grey velvet; a vintage brass coffee table with graceful legs from NY Showplace. They all take the edge off anything too new. A fitting drawing from Rachel Glittenberg, All Day I Think About You, acts as bejeweled foliage and water imagery for the wall. Fresh lilacs and Dutch peonies bring the room to life.